I am happy and proud to share this dramatization of that famous tea party scene from the book. It's a fun, interactive, action playscript for young readers and for those of us who shall remain, forever, young-at-heart. 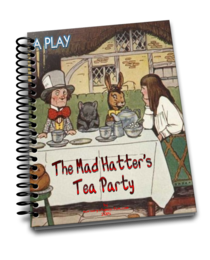 Whether, spectator or actor, familiar or not, with Alice’s Adventures in Wonderland, the March Hare or the Hatter, you’re sure to be a fan of this cute, wacky, completely crazy, playscript. The crazy tea party comes to life right before your eyes. It's a great way to introduce this classic story to young readers. Chuckles are unavoidable, from spectators and actors alike, while trying to decipher what these characters are thinking. Believe me, just listening to what they say, doesn’t always give a clue. You’ll see! If you’re an Alice in Wonderland fan, you will love this play. Not familiar? You, too, will soon say how much you love the Hatter. The Hatter, of course, is very well known throughout the Wonderland genre for his goofy comments, which most of the time, leave you scratching your head. Never fear, they are in full bloom here in this play. By the play’s end, you will see why the Hatter and the March Hare are so well loved. And why they remain popular and recurring characters in the movies, books, and other genre’s depicting Alice’s adventures. What a great way to introduce your young readers to Alice’s Adventures in Wonderland. It’s a true timeless, classic. Your e-book comes with an . . . The Mad Hatter’s Tea Party Play is totally risk free to try. Nothing to lose. If it isn’t everything I said it is, then return it for a full refund. You get instant access to your copy of The Mad Hatter’s Tea Party Play in under 10 minutes through a safe and secure transaction. Right after your order is approved (usually in seconds), you will be able to download immediately.